Having lived in Chennai for over three decades, I was surprised to discover yet another variety of yam, which is loved by most Tamilians. Pidi karunai kizhangu is neither the large yam nor colacasia, but the oblong shaped variety 3-4 inches in length. It is also known as chenai kizhangu or elephant yam. Champakaji informs me that it is a seasonal vegetable and seen in the market during winter months. 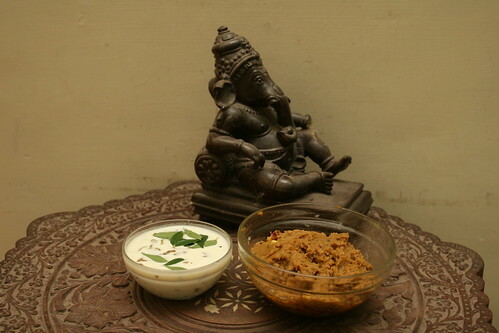 Popularly used to prepare curry as well as chutney (thovayal), it has a unique texture that makes it a pleasure to cook. Wash the yam thoroughly. Since yam is generally covered with mud and grit, you can soak it in water for a couple of hours. That will allow it to be washed easily. Pressure cook or boil until tender. Peel off the skin, wash to remove any remaining grit, and grind along with the red chillies, tamarind extract, jaggery, chilli powder, turmeric powder and salt. If you like, you can simply mash the yam and mix the ingredients well. Heat the oil in a wok. Add the gram and as it turns golden, add the mustard and cumin. Allow to pop and add the yam mixture. Roast for 10-12 minutes or until the mixture is well cooked and stops sticking to the sides of the pan. Serve with steamed rice and a dollop of ghee. Also makes a tasty accompaniment with rotis. This recipe was first published in The Great Granny Diaries – a column in Harmony Magazine. Part-1 of this post is the interview with Smt Champka Venkatraman, a Tamilian grandma from Chennai.